New Home in Middletown, Finished!! Ready Now. 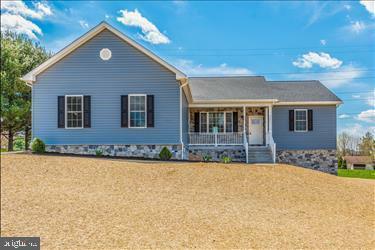 This Custom Style Ranch Home is Loaded with Upgrades. Its nestled on a cul-da-sac and has Gorgeous mountain views. One floor living, the main level has 2062 finished sqft. with all real Hardwood and ceramic floors. This home is much larger then appears from the street. Its has 3 bedrooms, 2 bath, with a 2 car over-sized garage. It has an open, large floor-plan with 9 ft ceilings and raised ceilings. Large master with walk-in closet, and large bath dual heads in shower and soaking tub. Beautiful Open Kitchen with Gleaming Black Stainless appliances, double wall-oven, cook top, breakfast nook, separate dining room, bathrooms with double sinks, gas fireplace and vaulted ceiling in living room. This home has all 36 inch door openings through out and could be set up for handicap access if needed. Dont Miss this New Home, with Middletown Schools, No City Taxes or Hoa. Hurry!